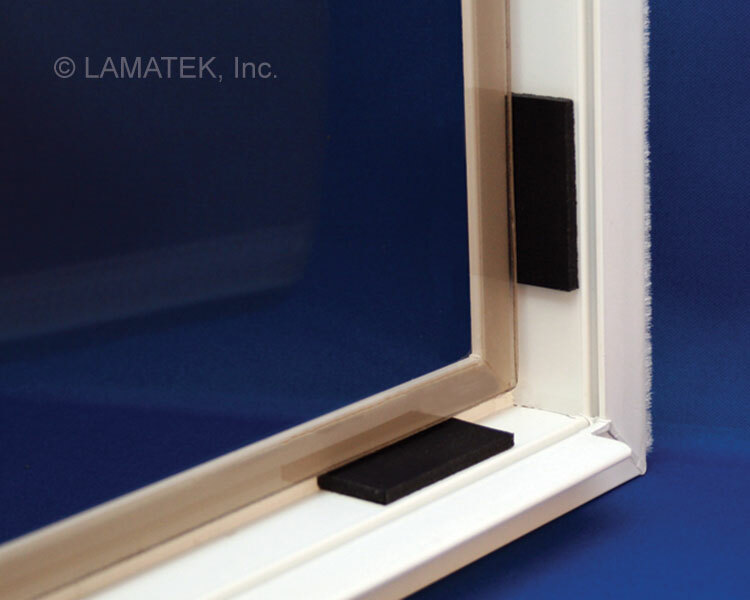 LAMATEK SmartBlox™ 2.0 is a proprietary, 85 Durometer, elastomeric material that contains no harmful phthalates. Setting blocks are a necessary component in window production that install between the sash material and insulated glass unit, to protect the IG from impact and provide stress relief as vinyl windows expand and contract with changing temperatures. SmartBlox™ 2.0 setting blocks help prevent stress fractures in glass and protect the integrity of the glazing bead. SmartBlox™ 2.0 was developed specifically for the Window and Door industry to be compatible with all glazing sealants as well as systems where shims may come in contact with Polyisobutylene (PIB) used in IG Spacers. View all Technical Specifications here. SmartBlox™ 2.0 blocks with adhesive backing are typically applied to the sash before the IGU is set inside. Non-adhesive blocks are simply wedged in between the IGU and sash after the glass has been placed. The size of the setting blocks is determined by glass size and industry standards. Surfaces should be clean, dry, and free from grease and oils for maximum adhesion. Firm application pressure and greater contact area will yield a stronger bond. Bond strengths will increase with time as the adhesive continues to “wet out,” or flow into microscopic pores of the bonded surface(s). SmartBlox™ 2.0 material is black in color and supplied cut to size with or without a high-performance, pressure-sensitive adhesive on one side. Why Do You Need Setting Blocks? Unlike rigid setting blocks, 85 durometer SmartBlox™ 2.0 provides a flexible cushion for insulated glass units (IGU) and supports dead load. Setting blocks are installed between the window sash and IGU to protect the glass from impacts and stress cracks. SmartBlox™ 2.0 protects the IG from stress by allowing room for thermal expansion and contraction as temperatures fluctuate. Setting blocks also promote drainage and protect the IG seal from any water that might enter the glazing pocket.